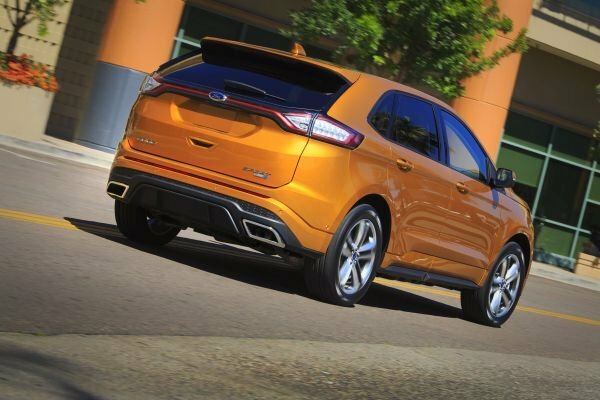 What changes will make the 2017 Ford Edge different? A couple new paint colors, a price increase, and perhaps a bit more standard equipment. Sales of this midsize crossover are up more than 50 percent since its model-year 2015 redesign and it probably won’t receive any major updates until at least model-year 2018. Ford’s focus for model-year ’17 is on its Escape compact crossover, which is receiving a substantial refresh. You shouldn’t. The ‘17 will probably cost more for what’s unlikely to be much tangible benefit. Plus, it’ll potentially age fast if Ford updates the styling for model-year ’18. Expect the ’17 to repeat the 2016 lineup with base SE model, volume-selling SEL, luxury-themed Titanium, and performance-flavored Sport models. All will again seat five and SE, SEL, and Titanium will offer both front-wheel drive and all-wheel drive (awd). The Sport will return with awd as standard, along with a more powerful engine than other Edges, specific styling touches inside and out, and uprated suspension tuning. If it has what you need and want in a midsize crossover. Ford adjusted the powertrain mix for ’16, dropping a V-6 from the SE’s options list and killing the front-drive version of the Sport. But the ’16 otherwise enjoys the benefits of the model-year ‘15 redesign that brought crisp new sheetmetal, slightly larger dimensions for more passenger and cargo room, and more advanced features, including Ford’s improved Sync 3 infotainment interface. Buying one helps you sidestep the almost-inevitable model-year ’17 price increase. And you’ll be able to exploit increasingly generous purchase and lease incentives that might not be around on the ‘17. Not until the midcycle refresh. The ‘15 redesign incorporated a new chassis, while introducing front-end styling that marked a new direction for the brand’s crossovers. The theme of the more pronounced grille, for example, is shared with the freshened ‘17 Escape. The ’17 Edge will carryover an interior that got a welcome upgrade in materials and more intuitive controls. Leaving three-row seating to Ford’s more family-oriented Explorer, Edge aims for a younger, urban vibe. It’s nonetheless exceptionally roomy, with more passenger and cargo volume than direct rivals such as the Jeep Grand Cherokee, Hyundai Santa Fe Sport, Nissan Murano, and Volkswagen Touareg. None likely. Expect the standard engine for the SE, SEL, and Titanium to gain be a 2.0-liter turbocharged four-cylinder with 245 horsepower and 275 pound-feet of torque. A 3.5-liter V-6 with 280 horsepower and 250 pound-feet of torque should remain a $625 option for the SEL and Titanium. Again exclusive to the Sport will be a 2.7-liter turbocharged V-6 with 315 horsepower and 350 pound-feet of torque. It’s apt to remain the most power V-6 in the competitive set. All engines will again pair with a 6-speed automatic transmission. Front-wheel drive will return as standard on the SE, SEL, and Titanium. All-wheel drive should return as a $1,495 option on these models and remain included on the Sport. It’s a feature we’d recommend for wet or snowy climates. Edge isn’t the most capable SUV when it comes to handling prowess. Even the Sport trades too much suspension compliance for only a marginal improvement in cornering. The Titanium is better-balanced and far less costly and its available V-6 is a good performer. Without major drivetrain changes, probably not. Fuel economy should again be about average for the class, despite some mileage-stretching features such as active grille shutters designed to improve aerodynamics by automatically opening and closing depending on vehicle speed. The front-wheel-drive SE also employs a stop-start system that automatically shuts down the engine at a stop and instantly restarts it when the driver releases the brake pedal. EPA ratings for 2017 weren’t released in time for this review but Edges with the turbocharged four-cylinder should return at 21/30/24 mpg city/highway/combined with front-drive and 20/28/23 with awd. Although the stop-start system isn’t taken into account in EPA ratings, Ford says the front-drive SE would rate 21/30/24 mpg if it was. With the 3.5-liter V-6, expect ratings unchanged at 18/26/21 with front drive and 17/25/20 with awd. The turbo V-6 Sport should return at 17/24/20 mpg city/highway/combined. Incidentally, Ford recommends regular-grade 87-octane gas for all Edges but notes that the two turbo engines were tested with 93-octane gas. That suggests you’ll get their full performance and best mileage using the more expensive octane. After receiving a raft of new amenities as part of its 2015 redesign, and the much improved Sync 3 infotainment system in 2016, don’t count on anything new and exciting for the 2017 model. SE models would come standard with most features expected in the class, including a rearview camera, Bluetooth connectivity, remote keyless entry, etc. SEL versions would add rear-obstacle detection, LED accent lighting, satellite radio, power driver and front-passenger seats, and dual-zone automatic climate control. Titaniums further gain a hands-free power rear liftage, Sony-branded audio system, 19-inch wheels (up from standard 18s), and leather upholstery with heated front seats and driver-seat memory. Sports gain a performance suspension, speed-sensitive adaptive steering, 20-inch wheels, and a body kit. They will be higher, but probably not by too much since we don’t expect Ford to make any dramatic changes. Base prices will likely span $29,000 for the SE, $33,000 for the SEL, $37,000 for the Titanium, and $41,000 for the Sport. Note that our estimate includes the mandatory destination fee, which was $895 for the 2016 Edge. The SE likely will remain unavailable with any major factory options. Most of the Titanium’s standard amenities should continue to be available on the SEL as part of the $2,710 “201A” and $875 Utility packages. A $795 Technology Package adds blind-spot alert and remote engine start and must be ordered with the 201A package. Titanium and Sport models are available with a number of exclusive options, including cooled front seats, hands-free parallel parking, lane-keep assist, and a front-view camera. Most of these items are bundled in option packages that cost anywhere from $3,150-$5,050. A panoramic sunroof is a $1,595 option for all but the SE. A few paint colors add $395-$595. A Class II trailer hitch would be another $435. A loaded AWD Titanium model should top out around $47,000, which is a bit high for a crossover that isn’t capable of seating seven or eight passengers. Expect the 2017 Ford Edge to be released in the fall of 2016. The optional Technology Package includes a number of worthwhile safety aids and even a navigation system for some models. We’d like to see Ford make it a standalone option across board, instead of forcing buyers to purchase other costly packages first. Revised suspension tuning to make the Sport ride better would be nice, too.